For maximum promotional impact, insist on Alpine BBQ Set. 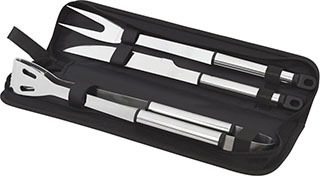 Budget priced, yet feature packed, this 3 piece BBQ set includes a knife, fork and tongs – all made from quality stainless steel. Supplied in a compact nylon carry case printed with your logo.